A hemangioma is a benign (noncancerous) tumor made up of blood vessels. A hemangioma occurs when small blood vessels begin to multiply at an abnormal rate and form a mass or lump. Some hemangiomas may develop after injury. There are several types of hemangiomas, and they can occur throughout the body, including in skin, muscle, and bone. Most hemangiomas occur on the surface of the skin or just beneath it. They often develop on the face and neck, and can vary greatly in color, shape, and size. 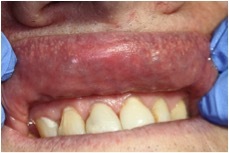 Hemangiomas are usually painless, red to blue colored lesions on the skin, lips, or inside the mouth. They are often soft to the touch. Most often they are flush with the skin or slightly elevated, but sometimes they grow from a stalk. 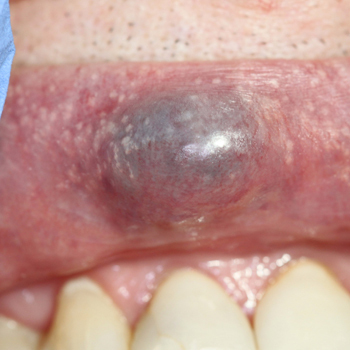 Superficial lesions may bleed or turn into sores, particularly if bumped or injured. Cavernous hemangioma: A cavernous hemangioma is made up of larger blood vessels that are dilated (widened). The blood vessels are not as closely packed as in other hemangiomas, and the spaces (or “caverns”) between them are filled with blood. When they develop in the skin, cavernous hemangiomas are often referred to as “deep,” and sometimes first appear as a bluish swelling underneath the skin. Because hemangiomas very rarely become cancerous, most do not require any medical treatment. However, some can be disfiguring, and many people seek care for cosmetic reasons. In most cases treatment does not involve surgery. Instances when surgery may be necessary include tumors that are deep in muscle or bone, or for tumors on the skin that cause problems with vision, breathing, or eating. 2. Anti-inflammatory medication: If a tumor is growing near vital structures steroids are often used to slow down the growth of the tumor. The drugs may be injected directly into the hemangioma, or given orally (in pill form). 3. Compression: Intermittent pneumatic compression is a treatment that uses inflatable sleeves or leggings to apply pressure to the tumor. It can be useful to decrease the swelling associated with a hemangioma. It will not, however, make the hemangioma go away. 4. Embolization: In this procedure, the blood supply to the tumor is closed off. This is a minimally invasive procedure where small particles are injected into the blood vessels to block them off. Sclerotherapy is a similar procedure where chemical agents are used to close off the vessels. These procedures can be very helpful in shrinking the tumor and decreasing pain. Often, however, the tumor will regrow its blood supply over time after these procedures. Embolization is also sometimes used prior to surgery to reduce the risk of heavy blood loss. Surgery may be recommended with a cavernous hemangioma if the lesion is destroying the healthy tissues surrounding it. In some cases, a hemangioma can cause painful symptoms severe enough to consider surgical treatment. Surgery involves excision of the lesion which is often performed under general anesthesia. The most common complication of surgery is hemorrhage. In addition, hemangiomas have a high tendency to reoccur after surgery, depending upon the type and location of the tumor. 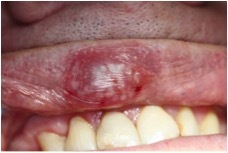 A 77 year old male presented with the chief complaint of an unsightly purple swelling on his lip, which has made him self-conscious. He desired to have it removed but was fearful of having surgery. After careful review of his medical history, (HTN, Heart Murmur, Asthma, and history of Bladder Cancer. Medication included: Claritin, Pulmicort inhaler, Ventolin, ASA 81mg, Cardizem, Lipitor, Prilosec, Flomax, & Proscar) we elected to treat the hemangioma with Laser Therapy. The patient was given informed consent with treatment options including: No treatment, Surgery, or Laser Therapy. He elected to have Laser Therapy. 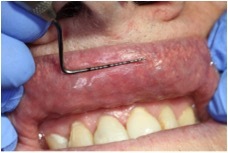 Local anesthetic was administered adjacent to the lesion. 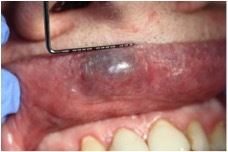 The PerioLase was used in “Non-Contact.” The purple pigmentation was no longer evident at the conclusion of the visit. 2 Week P/O: The patient reported localized swelling at site over the first 48 hours post-treatment with a burning sensation. No excessive pain was reported. Clinically, the lesion was ulcerated and appeared to have decreased in size and volume. 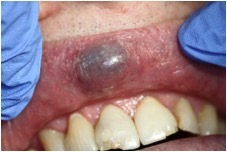 6 Week P/O: There appeared to be complete resolution of lesion with no evidence of pigmentation or swelling. The patient reported no discomfort and was very pleased with the result of Laser Therapy. Conclusion: Treatment of Cavernous Hemangioma’s utilizing the PerioLase MVP-7 Laser in a non-contact fashion appears to be a viable, safe, and much less invasive alternative to surgical methods.